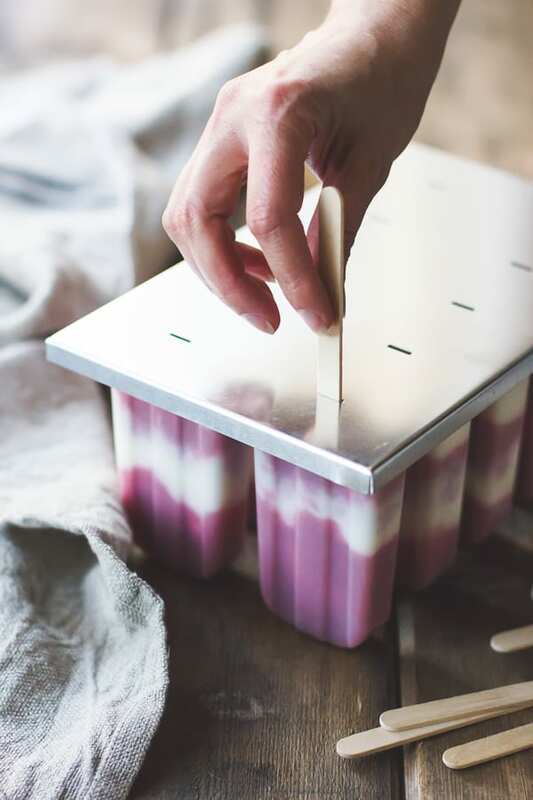 I’ve got an epic rant and popsicle post to share with you today, but first I wanted to let you know about a culinary Kickstarter campaign by my friend Vanessa, who is starting a company that produces boxes filled with 5 unique ingredients and recipes to use them. 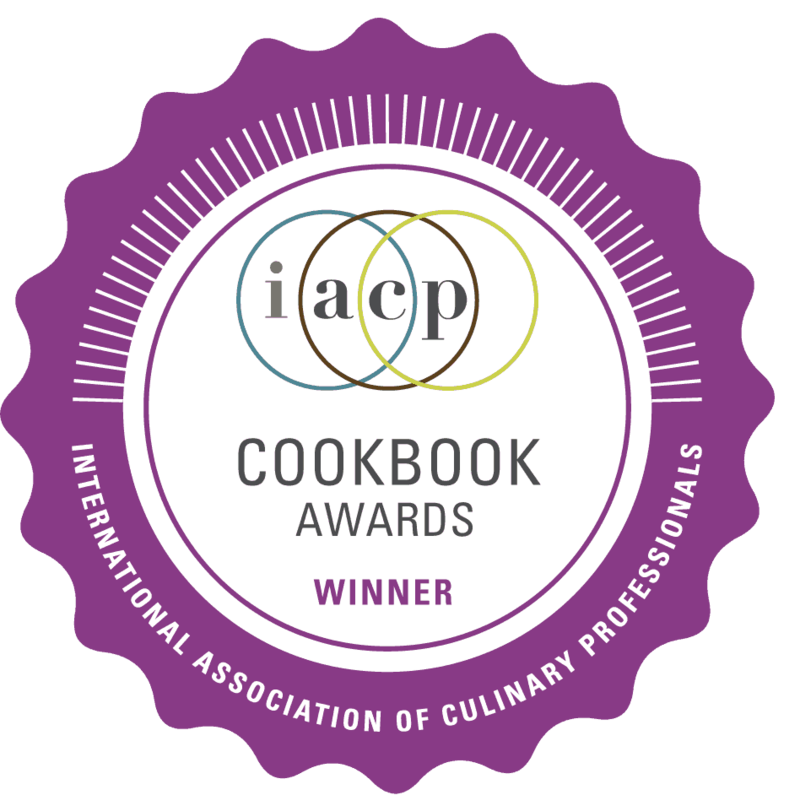 Vanessa is an accomplished home chef who has traveled the world, and her recipes are both brilliant and simple, with influences from various countries and continents. 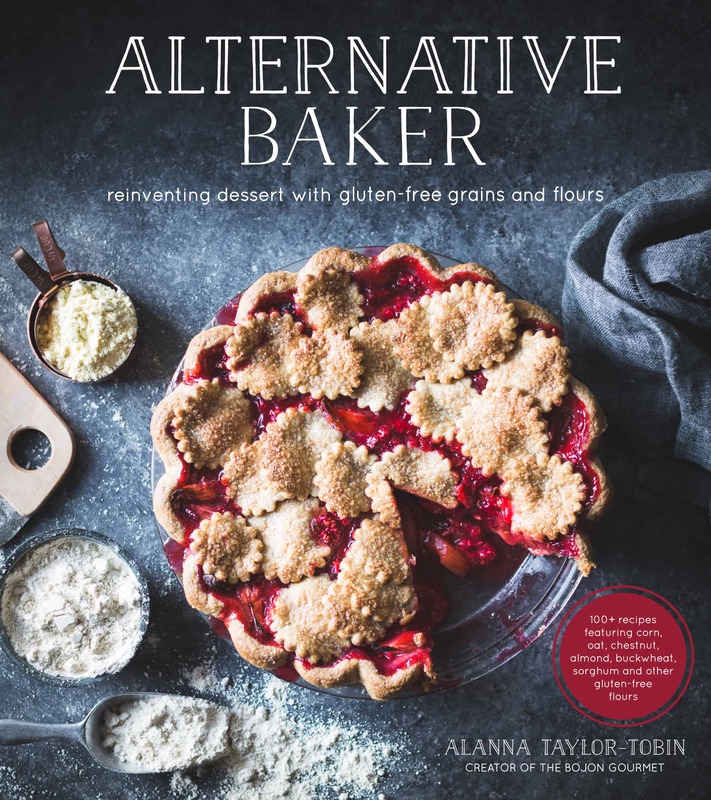 If you fancy, check out her campaign and help a foodie out. $20 gets you a box and recipes of your very own. The campaign ends this coming Monday, June 30th. Speaking of unique ingredients, I’m getting these fancy frozen treats in just under the wire for Wit & Vinegar’s Popsicle Week. While I am usually an epic procrastinator, this time it’s truly not my fault. I have a great excuse, and it’s not that the cat ate my homework (he prefers almond butter-tahini sauce). You see, for the past month, I’ve been pop-blocked. None of my local kitchen supply stores had the popsicle maker I was seeking, so I ordered one through Amazon from a kitchen supplies vendor; let’s just call them Surly Kitchen. The photograph of the image showed a silvery, metal lid holding 10 classic popsicle molds. It looked perfect. When it arrived a couple of weeks later, I removed it from its box, only to find that the mold actually had a blue plastic lid. This wouldn’t have been an issue except for the fact that I was planning to photograph it. The receipt in the box instructed me to contact the company for returns, so I wrote a congenial note saying that I had received the wrong item, a popsicle maker with a plastic lid rather than the metal one shown in the image, and that I would like to exchange it. I expected a reply along the lines of, “Oh, we’re so sorry! That was our mistake. Of course you can exchange it. Here’s a label so that you don’t have to pay for return shipping.” I don’t expect the customer to always be right – I worked at Farley’s – but I do expect a company to admit when they’ve made a simple error and take steps to correct it. So I reiterated the problem, adding that the lid was blue. The next day, they replied, “After reviewing the item information I found this item information clearly states the item is of BPA free plastic, there is no mention the top is made of metal. I am providing you the link for you to confirm the information I just provided you. Thank you for allowing us to assist you.” Prior to my purchase, I had read the description and saw that the lid claimed to be made of BPA-free plastic, but I had assumed that this referred to the underside or some such thing, since the image clearly showed a metal top. I followed the link and saw that they had changed the image to reflect the blue plastic lid. Meanwhile, the clock was ticking. I wanted to get a popsicle post up, and all I had was a blue plastic-lidded pop-tease. I briefly considered using the mold to begin testing recipes while I waited for the surly jerks who didn’t know how to run a business to grant me permission to return their stupid product. But their return policy clearly stated that the product had to be un-used. Since they were already trying very hard to prevent me from returning the mold, I imagined them jumping on any opportunity to send the thing back. They would undoubtedly include a bitchy note masked with false politeness explaining that since they found the DNA of tayberries on the mold, they would be unable to take it back. So I poured a test batch of popsicles into small glasses, using a chopstick as the handle, and balanced them precariously in the freezer. I was still wondering if perhaps I *had* mistakenly ordered the wrong product. Maybe the light in the photo had made the lid look like metal? “Aha!” I cried, triumphant. My receipt from Amazon included a picture of the mold with the silver, metal lid. “Look!” I said as I pointed out the image to Jay. But it was the principal of the thing. It irked me that they refused to take responsibility for the situation, or even admit to having displayed the wrong image in the first place. They tried to trick me by changing the image after the fact, and for what? I was only asking for an exchange. Surly Kitchen proved to be petty and unprofessional, and I’m still perplexed by the way they handled a pretty simple situation, including crediting my card with a refund before receiving the returned product. They still refused to pay for the return shipping, so I decided to be petty and unprofessional, too. I still have their popsicle mold. I ordered a new one from a different vendor, made sure that the description included a metal lid, and it arrived earlier this week. These were definitely worth the wait. 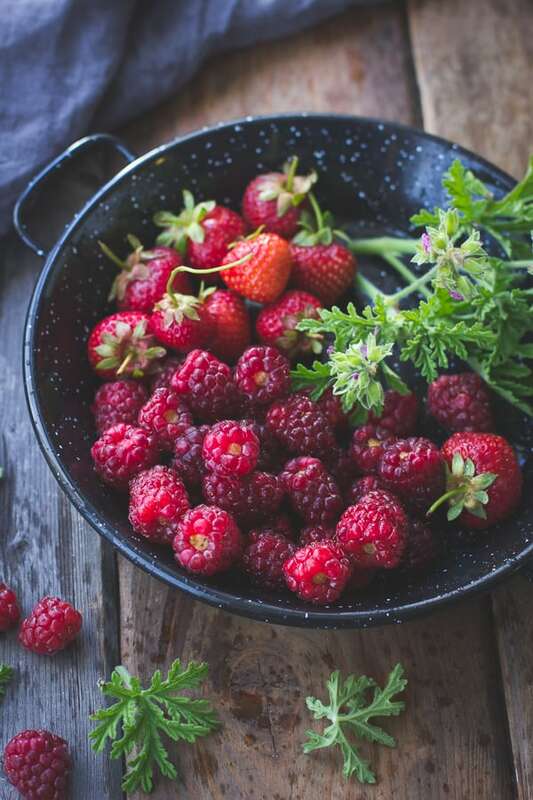 The base consists of tayberries, a raspberry-blackberry hybrid with a soft flavor that reminisces of roses. Tayberries aren’t as sweet or tart as other berries, so I paired them with some perfectly ripe Seascape strawberries, both of which I found first at the farmer’s market, and later, needing more popsicles, through Good Eggs. The flowery notes in tayberries are perfectly pitched with rose geranium, an herb often used in berry pies. 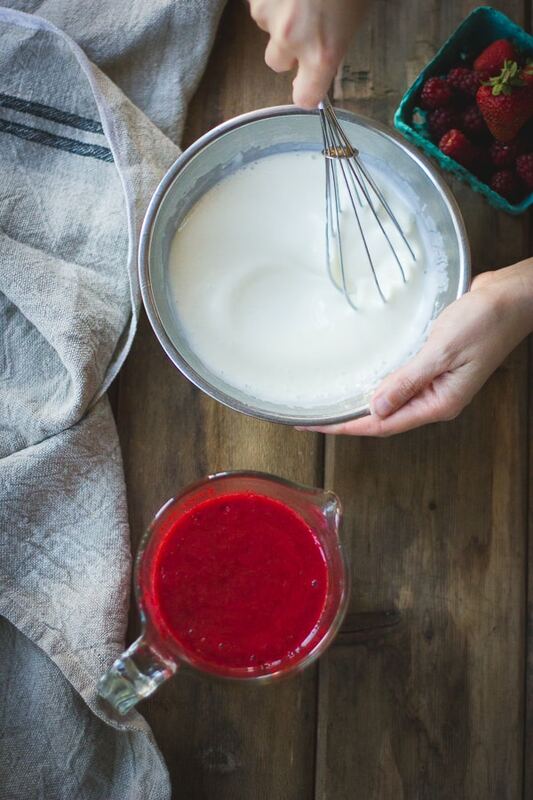 Its strong flavor can be overpowering, but infused into a simple syrup and softened with berry puree and creamy buttermilk and yogurt, it is positively intoxicating. Once you’ve tracked down the ingredients and a suitable popsicle maker, these are stupid easy to put together. 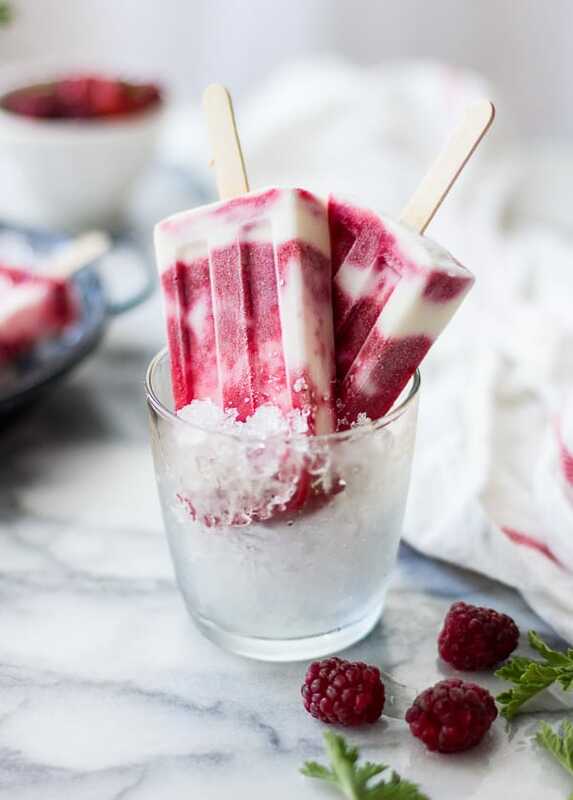 40+ amazing popsicle recipes can be found listed over at Wit and Vinegar. Thanks for reading! 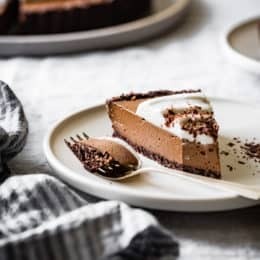 For more Bojon Gourmet in your life, follow me on Facebook, Twitter, Bloglovin’, Pinterest, or Instagram, or subscribe to receive posts via email. 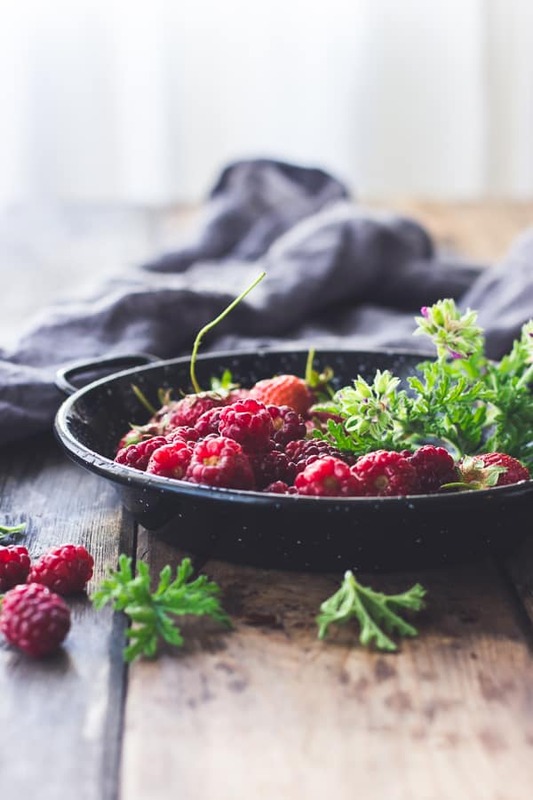 If you can’t find tayberries, feel free to use a mixture of blackberries and raspberries in their place, or another variety such as mulberries, loganberries, or marrionberries. 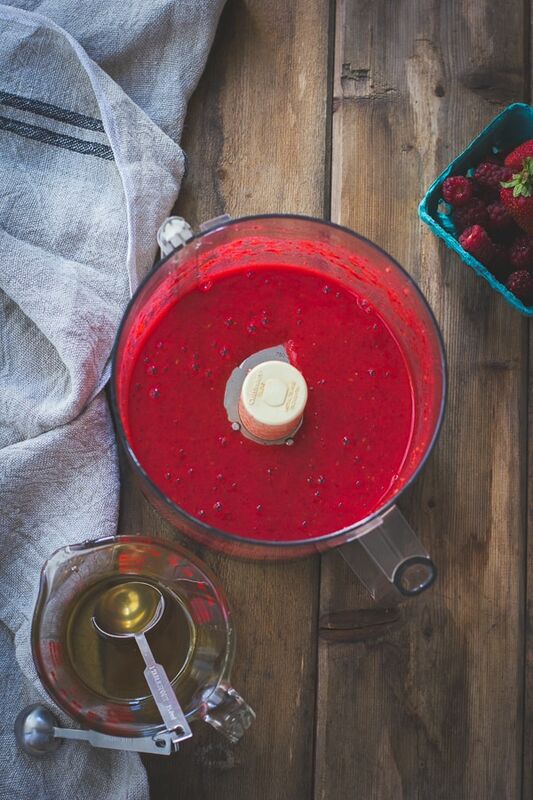 In place of rose geranium, make the simple syrup plain and stir in a teaspoon or two of rosewater into the berry puree and buttermilk mixture until you like the way it tastes. These keep well in the freezer for up to a month or two. 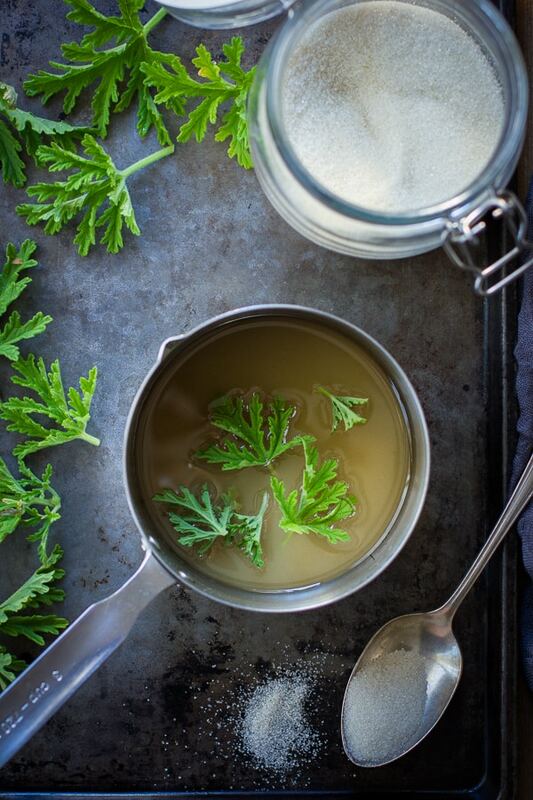 In a small saucepan, combine the sugar, water, and rose geranium. Bring to a boil over medium heat, swirling the pot occasionally to dissolve the sugar, then remove from the heat, cover, and steep 10-20 minutes. Strain through a fine mesh sieve, squeezing the leaves to extract all the good stuff. Discard the leaves. You should have about 1/2 cup of syrup. Cover and chill for up to 1 week if not making immediately. 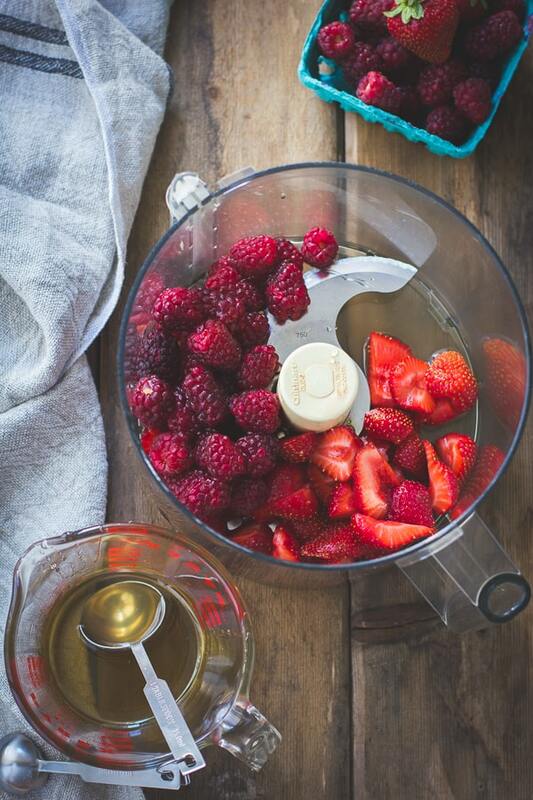 Place the berries and 5 tablespoons of the simple syrup in the bowl of a food processor and pulse until the berries are smooth. Scrape into a measuring pitcher for easy pouring. Combine the buttermilk and yogurt in a medium bowl and whisk smooth. Whisk in the remaining 3 tablespoons of simple syrup. Scrape into a measuring pitcher for easy pouring. 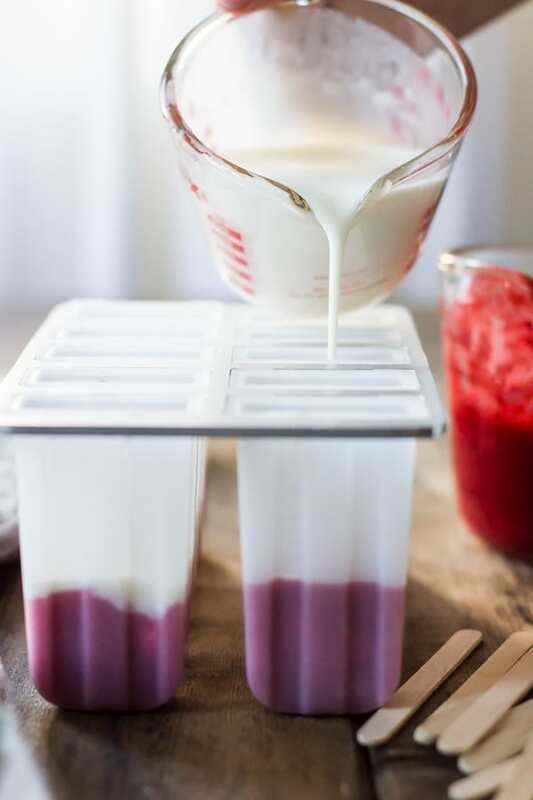 Fill 10 popsicle molds with about 1/3 of the berry puree, then gently pour in 1/3 of the buttermilk mixture. Pouring it slowly and aiming down the side of the molds will help get defined layers. Repeat until you’ve used up the mixtures and the molds are full. Freeze the pops according to the instructions on your popsicle maker. They will keep for at least a month in the freezer. That's so frustrating! I'm glad you got the mold you wanted (I have the same one and love it). These pops are absolutely beautiful and I love that there are floral notes in there. I'm with you, Alanna…it's the PRINCIPLE of the thing! Honor your customers by paying the shipping charges too. Someone made a mistake and it certainly wasn't the customer! And…those pops sound amazingly delicious! 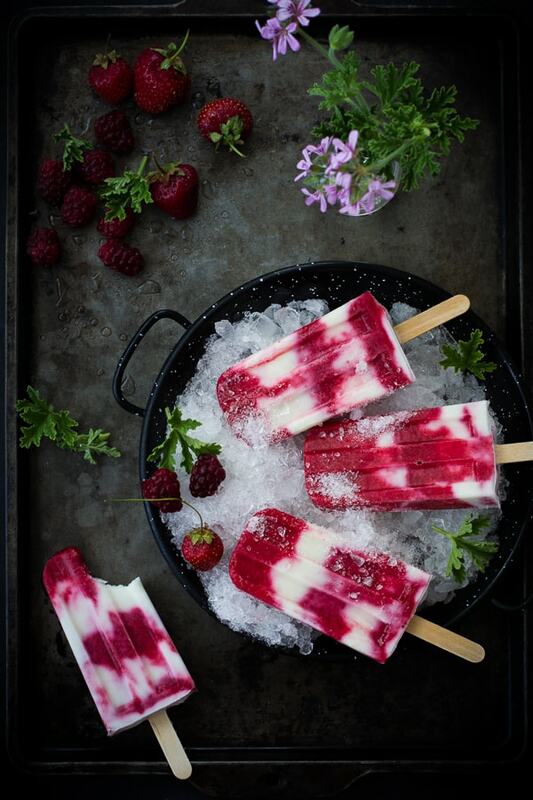 These popsicles are absolutely gorgeous! Sorry to hear about your Amazon drama; as convenient as they are, sometimes the vendors/services in their networks can be a little bit sketch. 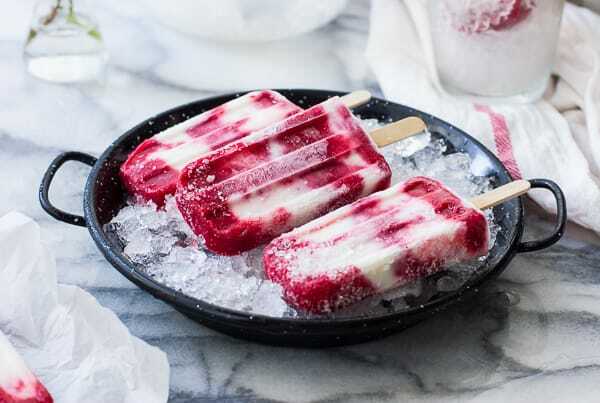 But glad you finally got what you wanted in the end and again, these popsicles turned out wonderfully! Such beautiful photos! 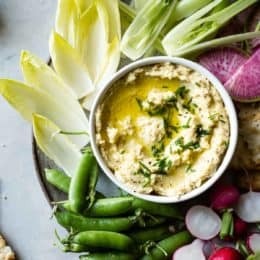 I love reading your blog, because it feels like you are hanging out with a friend in the kitchen, taking about food and life! I too would have been super annoyed that it was plastic! Looks so lovely!! Must try. Sounds so annoying with the molds. I don't get why you're not providing their name. When the treat their customers like that, they deserve it. All that aside we out here would like to be able to avoid them. Have a nice weekend! I thought about sharing their name, but I didn't want to escalate the situation any more than writing a public rant about them. I'll happily tell you if you shoot me an email (agoodie (at) gmail.com). Thanks for the kind note! gorgeous gorgeous GORGEOUS! 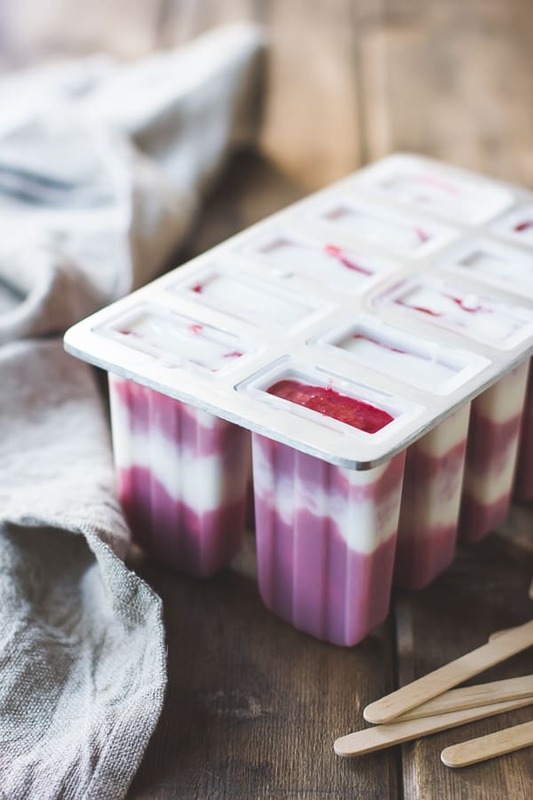 I just bought the same popsicle molds and have some white peach goat kefir pops chilling in the freezer to try though I doubt they will look as beautiful as yours. Aw, thank you, Aria! I was so pleased with how these images turned out. Those pops sound frigging amazing!! Will you be posting the recipe on your lovely site (oh please oh please)? 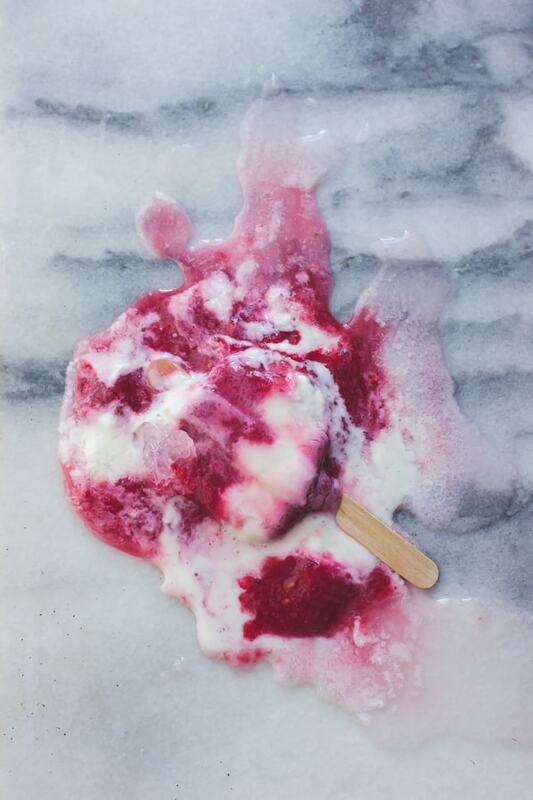 Gorgeous snaps, that last one of the melted popsticle is so funny! I totally get your rant, it is highly irritating when companies treat customers in that way. Thank you, Pang! I'll try to save you one, neighbor. :) I'm sorry to hear you had a similarly bad experience – boo! Though hearing that makes me feel a little less crazy, too. Thanks for the tip about contacting Amazon directly – that's a great idea! the pops look amazing. i never heard of tayberries but they sound lovely. what an annoying experience. don't they know the customer is always right! Thanks, Allie! That's high praise. :) And I'm glad my rant served a purpose other than making me feel a little less powerless against such an obnoxious company. What terrible customer service and how sneaky of them to change the picture once you'd called them out on it! You were right to hang out for the metal one – it looks so great in pictures and makes me really regret my plastic purchase now! I also love, love, love the flavours in these. So pretty and summer-y. I know, right?! That was the part that earned them their own designated rant of a post. :) Thanks for the kind words, Kathryn!! That sounds crazy making, and I sympathize. It IS the principle of the thing, and it was very naughty of them to change the image like that. I'm glad you were able to verify that you are not, in fact, crazy. That kind of thing drives me up the walls! Thanks for the kind and supportive words, Kate! Very naughty indeed. These pops are just stunning, I love the pretty layers! Thanks, Laura! I was so tickled by them when I unmolded the first one! These look absolutely beautiful! I honestly can't wait for summer to come! Thank you, Irene! I hope it shows up soon in your neck of the woods. 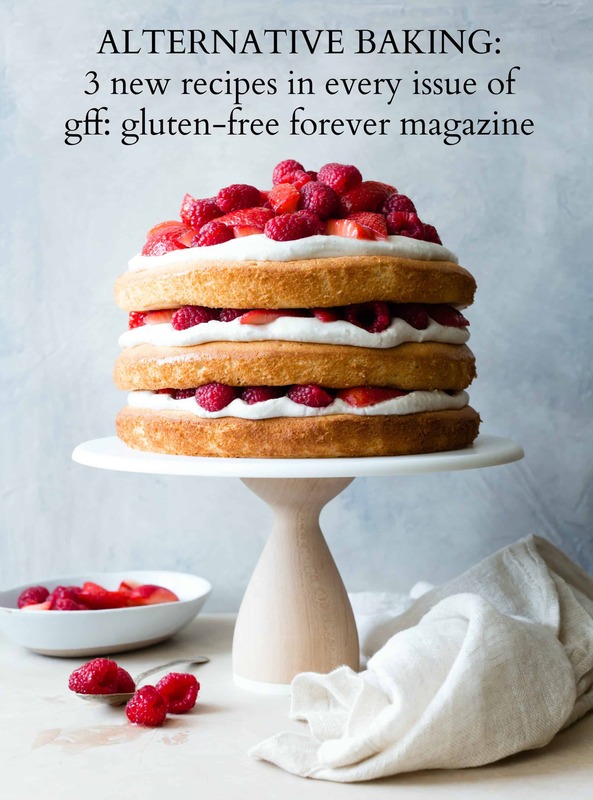 Thanks for yours sharing, yours stories reflecting perfectly the beautiful work all the food blogger & photographer are facing : you're wonderfull ! I do agree that the Amazon vendor did act in a none professionnal way, and do agree too that the principe is essential. Thank you, Mely! You are too kind. 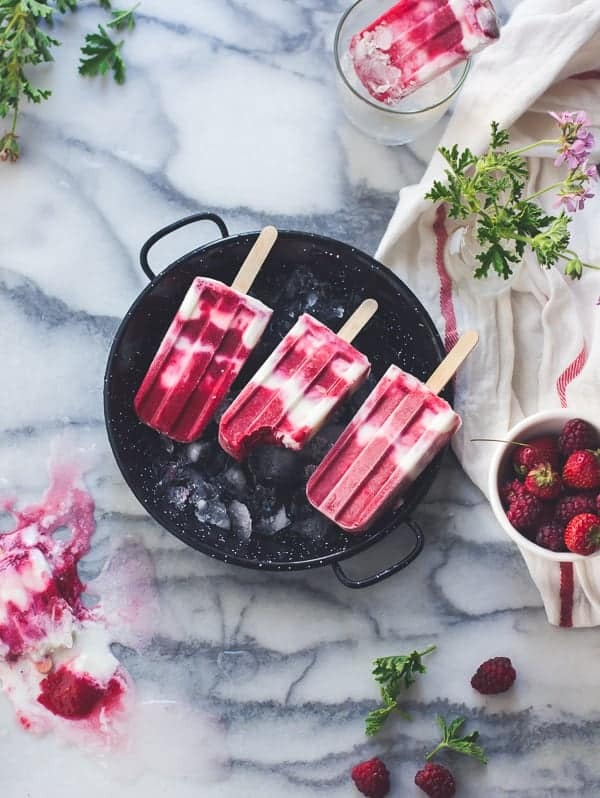 These popsicles look equally gorgeous and delicious, love your addition of rose geranium! 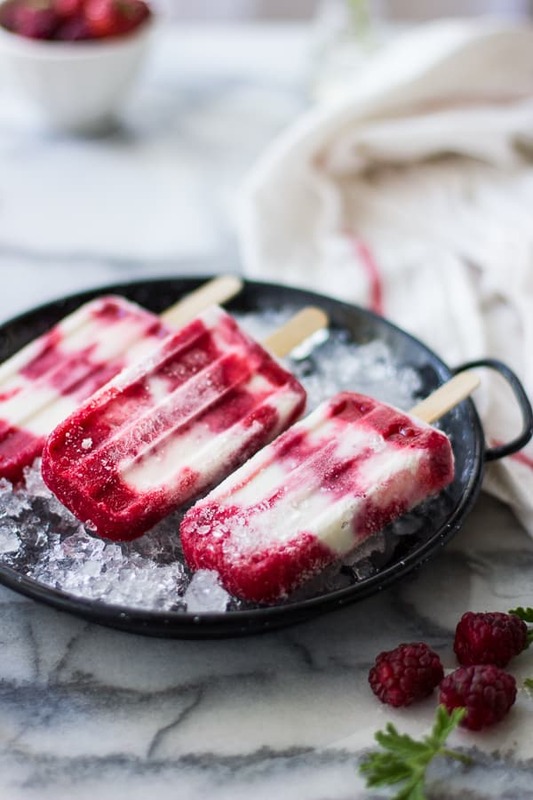 I'm a huge fan of popsicles and have made a few of the shared varieties already… totally adding yours to my to-do list! Side note (not intending to be a snarky first-time commenter! ), I had read that the metal lid in this type of mold is actually aluminum and can contain BPA that could leech into your popsicles upon contact, which is why many manufacturers have switched to the plastic. I myself have the ugly blue lid, but I guess I'll take that over BPA. Wah wah. Wah indeed! Thanks for letting me know about that. I didn't realize BPA was found in aluminum, too. Ugh. Luckily these pops didn't touch the metal top for the most part. Thank you so much for the kind words and the note! That's so infuriating! I had a similar situation earlier this year, with a super unprofessional Amazon vendor that sent us peach flavored charcoal (for lighting incense) instead of the unflavored kind we ordered. It was maybe $5, and they would NOT credit us or pay for a return or send the correct product. I did really enjoy leaving terrible feedback… after over a month of trying to politely sort it out, of course. 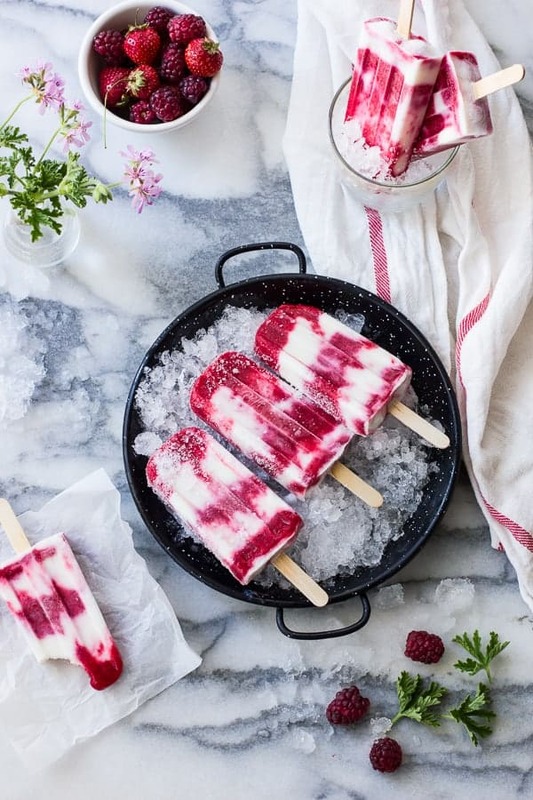 Anyway, in the end, your popsicles are super gorgeous! So I think you win. That is super uncool! I'm so sorry you had to deal with that, but glad that you enjoyed writing the terrible review. Thanks for the brilliant suggestion, and the kind words! Pop-blocked. Tee hee. Okay seriously I don't have many items in the kitchen that have only one use but this might be one I have to buy for the summer. And the rose geranium?? I had one for two years and never knew what to do with that lovely flavor. My plant died of dehydration last winter. Okay to be honest I just forgot about you out there on the sun porch. Sorry. Highly recommended! I neglected my rose geranium, too, until we eventually gave it to Jay's mom and now it is huge and happy in her garden. Yay! I love this rant. I hate when companies don't take responsibility, no matter how big they are! On another note, I can't even get over these gorgeous photos…. and the awesome flavor combo! I have made buttermilk ice cream and it's that slight tang that gets me every time. Thanks, Amanda! Now I'm majorly craving buttermilk ice cream. Yum! The colors in this post are mind-blowing!! That vibrant red is soooo pretty, I can't stop looking at it. Your blog is amazing! I love all the pictures. 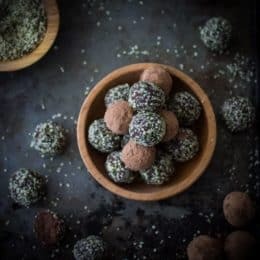 I started my own food and restaurant blog, alonewithacupcake.com just over a year ago and I only hope that it will look like yours someday =) I'd love any advice on how to make mine glow and flourish. Thanks and take care! What a frustrating company!! You should have said what company they were so we can avoid them. The popsicle maker you ended up getting is gorgeous though. As are the pics and the popsicles… Going to try them!! That is so frustrating, but good for you for arguing and for NOT using their molds in your photos. This recipe though, wow. I love that they're dairy based. I'm going to try them. I do need a popsicle mold and I'll beware of the false advertising. Enjoy!